Visitors walk in Santa Claus Village, around 8 kilometers (5 miles) north of Rovaniemi, Finland, Dec. 15, 2015. Most kids learn Santa Claus comes from the North Pole. But where exactly is a matter of much debate in Finland, Sweden and Norway. Most kids learn that Santa Claus comes from the North Pole, but children in Scandinavia are taught he lives a bit further south. Where exactly is a matter of much debate, with businesses in Finland, Sweden and Norway competing to cash in on the cachet that comes with claiming Santa's hometown. Danes, who enjoy milder and mostly snowless winters, teach their children that Santa's home is on the distant Arctic island of Greenland, a sparsely populated semiautonomous Danish territory. In the battle to beat their Scandinavian neighbors, Finland's public broadcaster YLE every year sends out a video of a red-cloaked Santa leaving his log cabin on a sleigh drawn by a white reindeer in the frozen snowy landscape that reaches millions of viewers worldwide. A regular feature for the past 30 years, it was first broadcast in 1960. The biggest town in Finnish Lapland, Rovaniemi, has been dubbed the official hometown of Santa Claus and depends on the myth for a large part of its yearly tourism turnover of some $230 million. Situated just south of the Arctic Circle, it attracts more than 300,000 visitors annually — five times the town's population. "Santa Claus is a very important and known person globally... and that's a good basis for us to build up this kind of business," Mayor Esko Lotvonen said in a recent interview with The Associated Press. The origins of Santa Claus — widely known elsewhere in Europe also as St. Nicholas — are shrouded in the mists of mythology, but the benevolent figure is believed to be based on St. Nicholas of Myra, a 4th century Greek Christian bishop who lived in a province of the Byzantine Empire that now is Turkey. A man dressed as Santa Claus leaves for his annual Christmas journey from the Santa Claus Village at the Arctic Circle in Rovaniemi, Finnish Lapland, Dec. 23, 2014. Danes, Swedes and Norwegians base their Santa on a mythological figure — a gnome known as a "tomte" or "nisse" in the Scandinavian languages — whereas Finns, who are ethnically and linguistically a different people, know Santa as "joulupukki," a Christmas buck or goat, derived from old pagan Norse mythology. In the Nordic region, Santa doesn't clamber down chimneys but visits homes on Dec. 24, meeting the children, or if he's too busy leaving behind a bag or basket of presents. 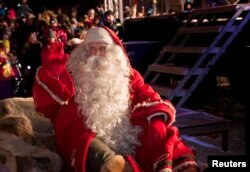 Mora in central Sweden has claimed itself as Santa's home since 1984, with some 50,000 visiting Santaworld annually. Nicklas Lind, director of Santaworld, which includes Santa's house, a troll safari, moose park and restaurants, says the town, known for its knives and an annual 90-kilometer cross-country skiing race, welcomes the extra money brought in by Santa but was unable to give figures. "It's very important for the region and the town, for hotels and skiing," he said. "We get some millions; that's all I can say." The message that Santa's home is somewhere in the Nordic region has spread far and wide. Santaworld's post office has received 400,000 letters this year addressed to Santa, his post office in Rovaniemi claims more than 500,000 letters with 100,000 more expected before the year-end. The Norwegian Santa in Drobak is too busy to talk as Christmas approaches. Instead, his cousin Tom picks up the phone but doesn't want to discuss business. "It's time for Christmas cheer not for competition, but we can't be angry if our good colleagues in Sweden, Finland and Greenland think otherwise," he says. "All Norwegian children know the real Santa lives here." Six-year-old Matias, who doesn't want to give his family name, looks puzzled when asked the question, before blurting out: "He lives in Korvatunturi [Ear mountain], of course." "And he's coming to see us again, he did last year," Matias says.